Below is a great article I found, by Del Sandeen, I just added a few pics, but it seems to me that parents these days are trying to make their young children look like adults. Many of them are doing away with soft hair bows, and yarn like my mama use to do, and now they're adding weaves, and all types of stuff. I thought it will be important to get on this subject, because folks are losing their minds, while their children are losing their hair. 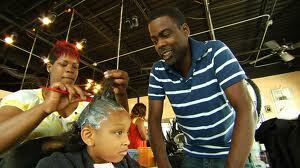 We need to come to grips and let folks know that your child is a child...let them grow and have a choice on their hair. Whether they want a perm, or not! Don't break it off before they get a chance to work with their own hair. 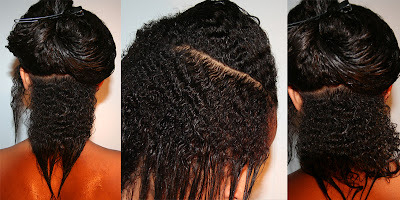 Just like your hair, chemicals are not good, and heavy weaves are definitely no good for young scalps. Read the passage below, hopefully it helps! For whatever reason, there are parents out there who aren't happy with how their child's hair looks. These are very young kids, usually under the age of three. Mom or Dad (or Grandma or Auntie) start looking for various styling methods, techniques, tools and accessories that will make the child's hair look like they want it to look. When it comes to very young heads, try to remember that less is more. 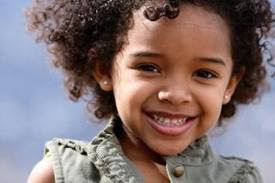 Young scalps are still developing and a child's true hair texture may not reveal itself until he or she is at least eight years-old. If a tender head is subject to harsh treatment on a daily basis (including chemical processes), it's possible that a child's hair will be permanently damaged, leading to hair loss. It's very common for babies to have odd hair growth patterns. They may have a full, lush patch on top with bald sides. They may be nearly bald all over. While this may be annoying for parents of a girl who want everyone to know she's a girl, slip a pink fabric headband over her head and call it a day. There's no need to wrestle with trying to get two little strands of hair into a barrette. Your baby's hair will grow and flourish if mostly left to its own devices. Use gentle shampoos and gentle techniques when combing or brushing. Beyond a little water and oil, you don't need to do much else to it. Before you know it, your son or daughter will have a head full of hair that you can then braid, plait, cut into cute styles and accessorize.